Old hands, Estancia Telken (and a Comet). The waves look and sound like the sea, but it is a lake. It's called Largo Buenos Aires , but it's no where near Buenos Aires . 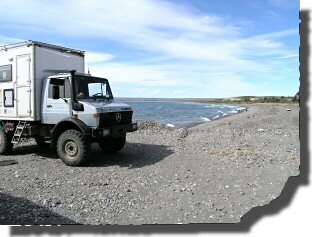 However it is a good free place to park just off RN43 between Perito Moreno in Argentina and the Chilean border at Chile Chico (S46.605022 W71.218755). We (Mel and Mog) are parked here to eat up all our meat, fruit and vegetables that will otherwise be confiscated when we enter Chile tomorrow. Two highlights of the otherwise fairly boring 600km drive north from El Chalten have been the Cueva de las Manos (Cave of the hands) and Estancia Telken . 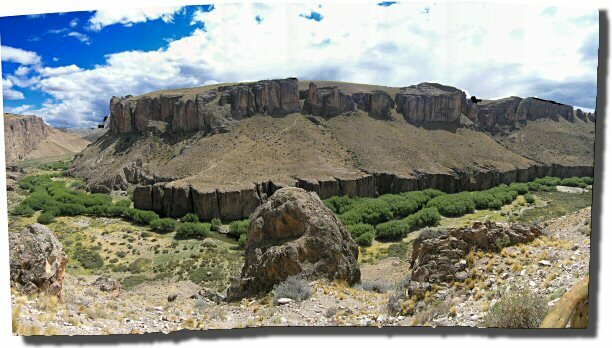 The Cueva de las Manos is a UNESCO World Heritage site about 20km east of RN40 set in a spectacular canyon. Access from the south requires a 47km drive from RN40 that ends a few hundred metres from the caves. Access from the north requires only a 25km drive, but you have to leave your vehicle about 3km from the caves on the other side of the canyon! The caves themselves are not spectacular but the art is. By far the most common image is that of a human left hand (there are a few right hands and one human foot print). 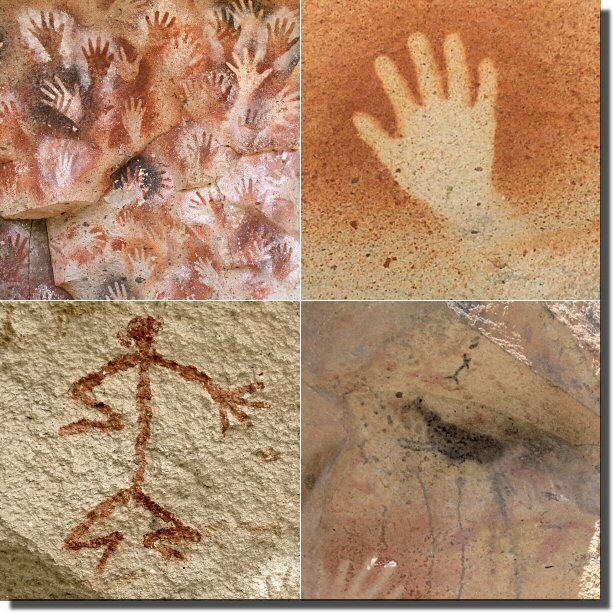 The hand-prints are negative, and were made by blowing or spitting "paint" (probably through a hollow bone) at the rock whilst protecting the rock with the hand. In some cases the rock was "painted" one colour first then a second colour was "sprayed" over a hand. Although the images date back about 9,300 years, the almost irresistible impression is that they were done a few weeks ago by an unimaginative, but persistent, vandal with three aerosol paint cans (red, black and white). More recent images include human figures and guanaco hunting scenes. 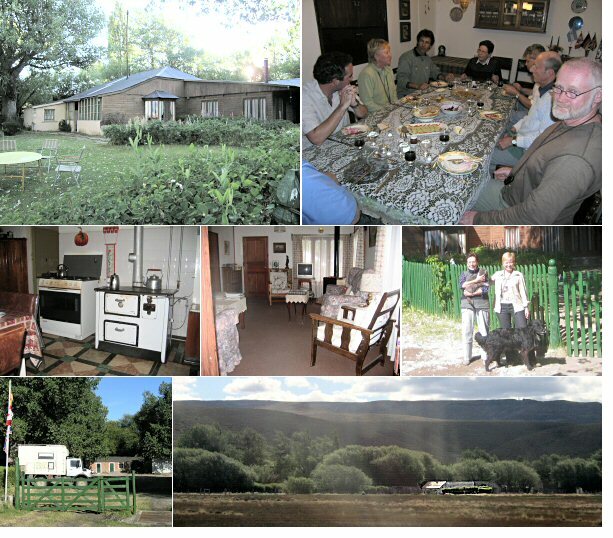 We also spent a night at Estancia Telken (S46.813878 W70.808378). Estancia Telken was solely a sheep farm for decades, until a volcanic eruption in Chile (in 1991, 160km away) deposited a layer of ash on their land that resulted in the death of most of their sheep. Since then Petti and Coco Nauta have diversified into tourism. The estancia offers rooms, camping ($5USA per person per night), meals ($20USA for a substantial evening meal) and horse riding. The estancia also has a lake (good for bird watching) and a small cave with a few "hands" if you missed the big one. Our evening meal was served family-style with Petti and Coco at the heads of the table, making us feel as if we were back at home having a delicious home-cooked Sunday dinner.Recommended. And finally the comet. For the last few nights we have been watching a very impressive comet visible between 23:00 and 03:30 each night in the south. Because we have not seen any English language newspapers or TV, we don't know if it is an expected comet, a new one or even on a collision course with earth! Although very spectacular to look at, we have not yet taken a photograph worthy of these web pages (even with a lot of PhotoShop work). But we have been sent one!